ANSEW INTERNATIONAL are professional chemical supplier since foundation of 2007. With company principle"Responsibility,Reputation and Service", we serve customers and partners in almost all countries of the world. 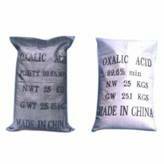 Accompanied with a continuously-increasing and developing business, we succeed to enhance OXALIC ACID to 4, 500 ton annually. 25kg net per pp. pe. bag. WHITE TRANSPARENT CRYSTAL COMBINING TWO CRYSTAL WATER, MELTING POINT 101-102, SPECIFIC GRAVITY 1.653, EASILY SUBLIMATE AT 100, EASILY DISSOLVE IN ALCOHOL AND WATER. Usedas purifying agent in pharmaceutical industry, precipitating agent in rare-earth element processing, bleaching agent of fibers, rust-remover, and grinding agent, etc.